Platinum Tools has launched the MapMaster mini Pocket cable tester (p/n T109C), which will be featured during the 2019 NAB Show, held in Las Vegas, Nev. from April 8-11. The NAB Show is located at the Las Vegas Convention Center, and Platinum Tools will be in booth # C11447. They will also be at ISC West 2019, held in Las Vegas from April 10-12 at the Sands Expo and Convention Center, booth #6035. 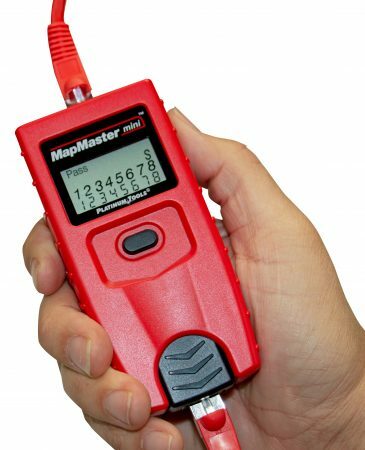 The MapMaster mini determines wire condition, whether good or faulty, and displays it on its LCD display. A set of five mapping remotes is included for locating cables terminated in wall jacks or patch panels. The MapMaster mini also identifies the patch panel port where network cable is terminated and can find and fix the position of exposed or hidden cables.